Rated 4.0 out of 5.0 based on 455 surveys. Disney's version of a budget resort features three distinct themes executed in the same hyperbolic style. Spread over a vast expanse, the resorts comprise 30 three-story motel-style guest-room Buildings. Although the three resorts are neighbors, each has its own lobby, food court, and registration area. 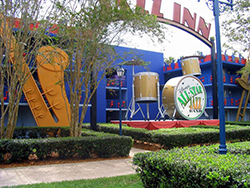 The All-Star Music Resort features 40-foot guitars, maracas, and saxophones. 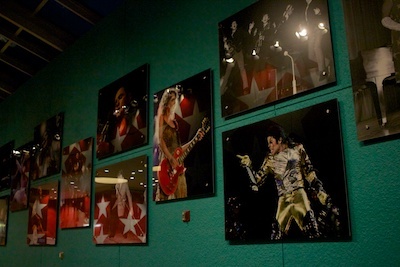 Lobbies of all are loud (in both decibels and brightness) and cartoonish, with checkerboard walls and photographs of famous musicians. There's even a photo of Mickey Mouse with Alice Cooper. Each resort has two main pools; Music's are shaped like musical instruments (the Piano Pool and the guitar-shaped Calypso Pool. All six pools feature plastic replicas of Disney characters, some shooting water pistols. 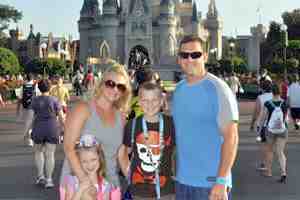 Sarah Stone's Mousesavers.com has a current list of Disney hotel discounts available at All Star Music. 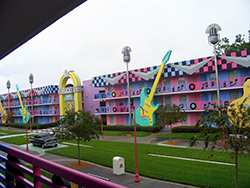 In terms of layout, architecture, and facilities, All Star Music is similar to Pop Century, the All-Star and Art of Animation Resorts: 3- and 4-story, motel-style Buildings with a central pool, food court, and registration area. Look for Building-sized music-related icons. A security gate guards the entrance to All Star Music's grounds. If you arrive by car, you'll need to provide photo ID at the gate; it's not necessary to provide your reservation number or paperwork. A dedicated parking lot across from the lobby serves as temporary parking for those who need it while checking in. Melody Hall is All Star Music's lobby. 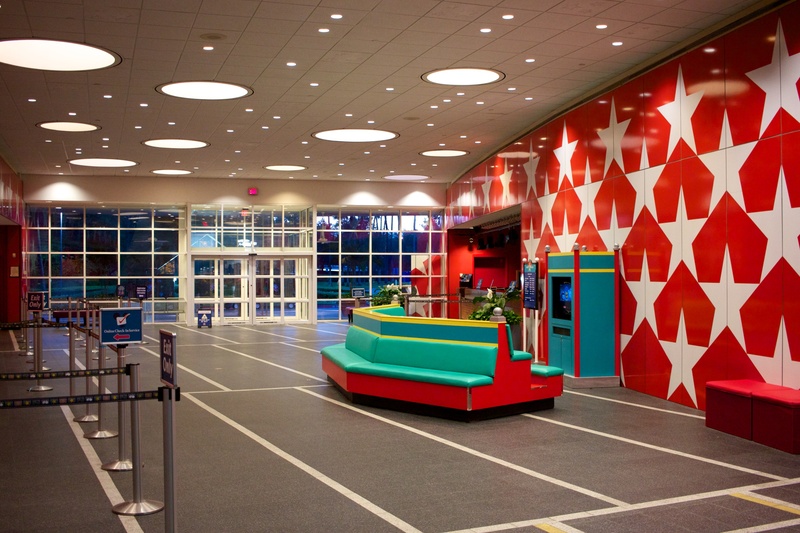 In it you will find the check-in counter, concierge, Note'able Games Arcade, the gift shop Maestro Mickey's, and Intermission Food Court. Check-in time at All Star Music is 3:00 PM, and check-out time is 11:00 AM. All Star Music participates in Disney's Online Check-In program, which allows you to you provide name, address, and credit card information up to 10 days before your arrival. If you've done this, look for an Online Check-In sign near the Registration Desk. You'll be routed to one of the Online Check-in staff and should be on the way to your room in a few minutes. All Star Music's registration staff can provide Magic Bands for your stay, if you don't already have them. Get theme park tickets and dining reservations at the Concierge Desk, to the right of the Registration Desk. If you need to check in and obtain theme park tickets, you can save some time in line if one adult gets in line for tickets just after another adult starts the registration process. The Concierge Desk can also make Disney dining reservations, and you can avoid a wait there by making them online prior to arrival. 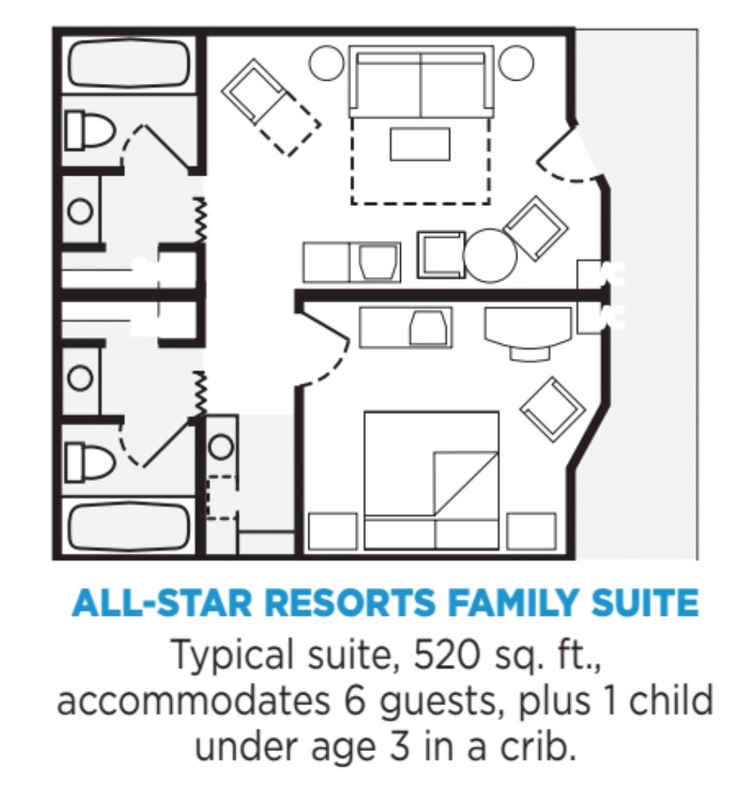 At 260 square feet, standard rooms at the All-Star Resorts are very small—the same size as those at Pop Century Resort and slightly smaller than Art of Animation’s standard rooms. All-Star rooms are so small, in fact, that a family of four attempting to stay in one room might redefine family values by week’s end. Each room has two double beds or one king bed, mini-fridge (no coffeemaker), a separate vanity area, and a table and chairs. Bathrooms have curved shower rods, an improvement. Except for artwork and bathroom wallpaper, all three resorts’ rooms are furnished identically. No rooms have balconies. 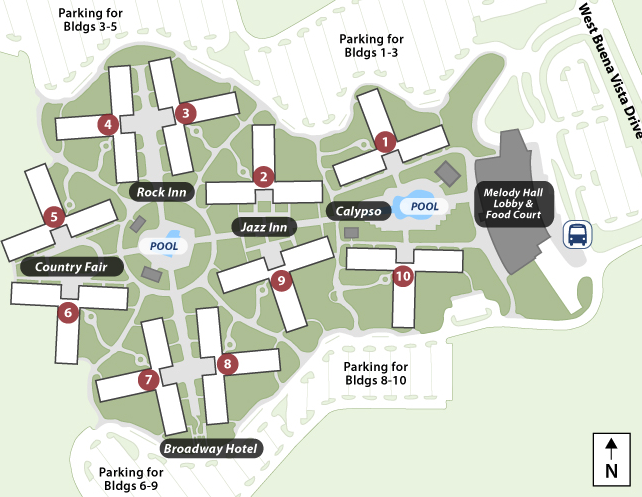 In the Jazz and Calypso Buildings, the 192 suites measure roughly 520 square feet, slightly larger than the cabins at Fort Wilderness but slightly smaller than Art of Animation’s Family Suites. Each suite, formed from the combination of two formerly separate rooms, includes a kitchenette with mini-refrigerator, microwave, and coffeemaker. Sleeping accommodations include a queen bed in the bedroom, plus a pullout sleeper sofa, a chair bed, and an ottoman bed. We’re not sure we’d let adult friends (ones we want to keep, anyway) on the sofa bed or the chair or ottoman beds, but they’re fine for children. A hefty door separates the two rooms. 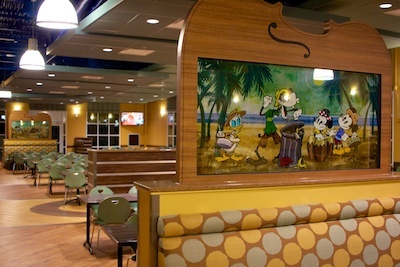 The All-Star Music Family Suites also feature flat-panel TVs plus two bathrooms—one more than the Fort Wilderness cabins. The suites cost about 25% less than the cabins and about 20% less than the Art of Animation Family Suites, but they don’t have the kitchen space or appliances to prepare anything more than rudimentary meals. If you’re trying to save money by eating in your room, the cabins are your best bet. If you just want a little extra space and somewhere to nuke your Pop-Tarts in the morning, the All-Star suites are just fine. A standard All Star Music room. The mini-fridge is a dorm-style unit that sit under a counter or desk. It's more like a beverage chiller than a refrigerator in that it'll keep drinks cool, but you're not going to freeze popsicles or make ice cubes in it. You will also find a microwave and coffee maker in the family suites. All Star bathrooms are tiny. Almost all feature a tiled tub with shower, while some wheelchair-accessible rooms have a roll-in shower without tub. One nice feature in the standard bathrooms is a shower curtain rod that curves outward, so you're not always elbowing the shower curtain while shampooing. Water pressure in the shower is average - probably less than what you get at home, but still enough to get your hair clean. Eventually. Bathroom and dressing area and sink in All Star Music's rooms. The guide didn’t prepare us for the large groups of students who take over the resorts. They’re very noisy and very pushy when it comes to getting on buses. Our scariest experience was when we tried getting on a bus and got mobbed by about 100 students. I would never recommend the All-Star for a family. It was like dormitory living. Our room was a long hike from the bus stop, and it was tiny—you needed to step into the bathroom, shut the door, then step around the toilet that blocked half the tub. All Star Music has around 200 handicap-accessible rooms. Some feature roll-in showers, while others include assistive hearing devices. A subset of these rooms have been converted to comply with Florida's Accessibility Code, with changes to everything from bed, counter-top, and dresser drawer height, to door widths, wheelchair ramps, and more. Some of Music's accessible rooms have the standard setup of 2 double beds; all rooms with roll-in showers have 1 king bed, and a small number of roll-in shower rooms have both 1 king bed and 1 double bed. Use our hotel room finder to see which rooms have which features. Disney knows that some hotel rooms are better than others. Most people prefer to be close to the lobby and dining, and want something pretty to look at from their hotel room window. To capitalize on this, Disney categorizes all of All Star Music's hotel rooms based on how long it takes you to walk to the lobby. A Preferred Room with Standard View is a room in buildings 1, 2, 9, or 10 that is close to the Melody Hall Lobby and Intermission Food Court. The view from your window may include the pool, landscaping and trees, other buildings, maintenance areas, or be blocked almost completely by a giant decoration. Standard Rooms are found in All Star Music buildings 3, 4, 5, 6, 7, and 8. These Standard rooms are either a slightly farther walk to the lobby (an extra 3-5 minutes), and have generally unremarkable views of landscaping or parking lots. These are the cheapest rooms at All Star, but there are some gems to be found in this category, though, using our All Star Music Room Finder. It was so nice to have a place to unwind without the kids at night, along with two bathrooms and extra space for breakfast/snacks/ drinks in the kitchen area. My only issue was that we weren’t comfortable leaving the kids on the foldouts because they’re right next to the front door, plus my husband and I didn’t want to be confined to the bedroom from the time we put the kids to bed, so we slept on a foldout. The first night was hell, but the second night we took the mattresses off the pullout chair and ottoman and put them on top of the mattress on the couch—MUCH better! We found the All-Star Music Family Suite to be very roomy for the six of us. Our teenagers and preteen were quite comfortable on the pullout sofa, chair, and ottoman. Having the two bathrooms was a must, and the kitchen area was great; lots of shelf space for the food we had delivered from Garden Grocer (they’re excellent, by the way) [see page 482]. Our only complaint is that from 7:30 a.m. until midnight there’s always music playing—it can get annoying to always have that beat going in the background. The rooms are soundproofed but not enough; had to use earplugs. All Star Music has 2 pools. 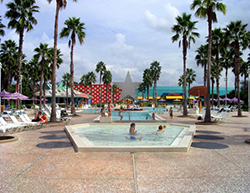 The largest, Calypso Pool, sits directly behind the Melody Hall lobby and food court, between the two buildings dedicated to the genre of the same name. 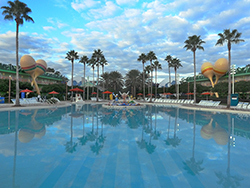 The pool features a sculpture of The Three Caballeros that shoots out streams of cold water. The other smaller pool, The Piano Pool, is located near buildings 2 through 8. 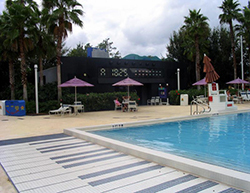 This pool area is themed like a like a piano, and features large piano keys on the ground. The Piano Pool is considered a "quiet pool," meaning that loud play and splashing around are discouraged. The Piano Pond Pool is a quiet pool, free from loud play and splashing around. All Star Music's pools range in depth from around 3 feet 6 inches/1.1m to 4 feet 9 inches/1.4m. Music's pools are open every day, including winter. Pools are heated to 82F/28C throughout the year. We've swam in temperatures as cold as 40F/4C; the water was fine, but getting out was a shock. All Star Music does not have a hot tub or jacuzzi; those are found at Disney's moderate and deluxe resorts. 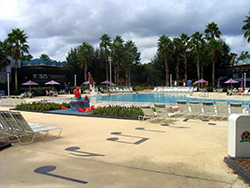 There are no water slides at All Star Music's pools, or any of the value resort pools for that matter, but guests can find showers, storage lockers, restrooms, and laundry facilities at each of the two pools. Pool hours are at least 9 AM to 8 PM, extending to as much as 7 AM to 11 PM during busy times. The Calypso Pool will have lifeguards during most of the day, but Piano Pool will not have lifeguards at any time. Disney almost always stocks extra towels poolside, so you won't need the ones from your room. If, for some reason, you end up using your room towels at the pool, just call Housekeeping when you get back and request more. Pool toys are permitted in All Star’s pools, including "pool noodles" (which you may find at the Maestro Mickey's shop in the lobby), and basic toys that would be appropriate for water use such as rubber duckies and bucket & shovel sets. Some of us will occasionally bring something like a whiffle ball for playing catch in the pool. As long as you’re not disturbing other guests, you’ll be fine. Also note that kids with pool toys become very popular with other kids in the pool who want to play too. If you’re traveling with an only child and want him to have some age cohort interaction during your vacation, a nice strategy is to bring some extra toys. Chances are he’ll make a buddy. All Star Music's Calypso Pool has a chair-lift device that can lower guests in wheelchairs into the shallow end of the pool. Check with any lifeguard for assistance on using the lift. 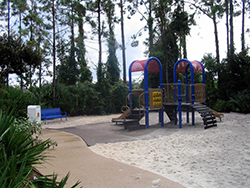 A small playground set is located between the Jazz Inn Building 9 and Calypso Building 10. 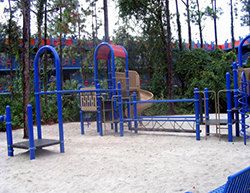 The set has two small plastic slides and a couple of sections with a few steps for toddlers to go up and down. Safety seems to be Disney's concern here - there are no swings, and most of the area is covered in sand with small sections of a springy, poured rubber surface. There's no full-service restaurant at any Disney value resort, including All Star Music. Intermission Food Court is set up like a food court at a mall. There are 5 different stations, each selling one set of meals. For example, one station sells pizza and pasta; another sells burgers; another is dedicated to sandwiches, and so on. If your kids each want something different, you'll have to line up several times. The good news is that some of the food is prepared on demand, so you'll at least be getting your burger cooked to order. In the summer of 2017 Disney began testing a new food court format at All Star Music. In the new version, guests order from the cashier, pay for their food, and receive a pager (like restaurants give out). When the pager goes off, the food is picked up at a window. The bonus with this is that it removes the clustered, back-and-forth ordering process caused by the multiple stations. It is unknown at this time whether this test will spread to other resorts and it may be discontinued at All Star Music without notice. Intermission Food Court is set up like a mall food court. Seven different stations each serve a different type of food. A separate beverage station serves free refills on fountain drinks, coffee, and tea. Free refills are available for coffee, tea, hot chocolate, and fountain drinks (including juice and milk) during your meal at Intermission Food Court. A huge beverage station sits just beyond the cash registers, and this station also provides toaster ovens, hot water, ice, condiments, and napkins. Intermission Food Court also participates in Disney's Rapid Fill refillable mug program, where you purchase a souvenir plastic mug once, and get free refills for the remainder of your stay. The cost is a flat $17.99 for your length of stay. Intermission Food Court participates in the Disney Dining Plan; meals cost 1 Quick Service credit, and there are a wide variety of snacks to use as Snack credits on the Dining Plan. 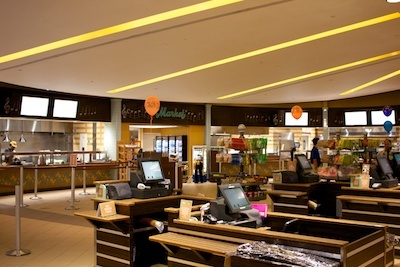 Singing Spirits Bar Just outside of the food court and on the way to the Calypso Pool is the Singing Spirits Bar. Singing Spirits has outdoor seating and a limited drink menu, with several beer selections, a couple of wines, and a small selection of spirits. It's fine if you want a Budweiser or strawberry margarita to relax with by the pool, or to get a nightcap on the way back to your room for the night. Singing Spirits Bar is usually open 12 PM to 12 AM daily, weather permitting. Driving Your Own Car Disney's All Star Music Resort is just off of I-4 in Lake Buena Vista. Take I-4 Exit 65 - Animal Kingdom / Wide World of Sports and you'll end up on Osceola Parkway. Stay on Osceola for 2.8 miles, then turn left on Buena Vista Dr. Go about 0.7 miles/1 km down Buena Vista Dr, then turn right on to Melody Ln, which is All Star Music's entrance road. You'll see All Star Music's sign well before you need to turn. From Sanford International Airport It's about a 40-minute drive from Sanford to All Star Music. If you're not renting a car, be aware that Sanford's airport offers fewer transportation options than Orlando's, and Sanford's options are generally much more expensive. A taxi from Sanford International Airport to All Star Music will cost between $120 and $150, depending on traffic. Mears Transportation offers 3-passenger towncar service to All Star Music for around $140 each way, plus tip; 5-passenger SUV service or 10-passenger van is around $190 each way. That means round-trip transportation will run you somewhere between $240 and $380, plus tip, between Sanford and All Star Music. At those prices, it may be less expensive to rent a car and park it at the hotel. Getting to the theme parks, water parks and Disney Springs Disney provides free bus service from All Star Music to the Magic Kingdom, Epcot, Disney's Hollywood Studios, Animal Kingdom, Blizzard Beach, Typhoon Lagoon, and Disney Springs. 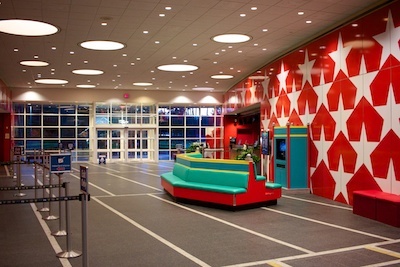 All Star Music's bus stops sit along the front wall of the Melody Hall lobby, between the lobby and check-in parking lot. Each theme park has its own bus stop somewhere along the wall. Animal Kingdom's bus service is shared with Blizzard Beach, while Disney Springs and Typhoon Lagoon also share a stop and service. All Star Music shares bus service with All Star Sports and All Star Movies. If you've got your own car, it's faster to drive yourself to Disney's Animal Kingdom, the Typhoon Lagoon and Blizzard Beach water parks, and Disney Springs. Disney's bus service is faster to the Magic Kingdom, Epcot, and Disney's Hollywood Studios. We evaluate All Star Music's bus service annually, and the latest transportation times can be found below. Each theme park has its own stop on All Star Music's bus route. Ask a Disney Cast Member about Music's bus schedule, and they'll tell you that buses run about every 20 minutes. In reality, Music's bus schedule varies considerably depending on the time of day and where you're headed. 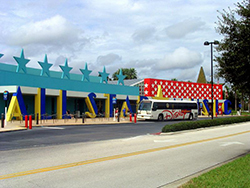 Getting to another hotel from All Star Music If you've got dining plans at another Disney hotel, the cheapest option is to take a Disney bus from All Star Music to Disney Springs, then take another bus from Disney Springs to your destination hotel. Do the reverse to get back to All Star Music. While that's free, it can take anywhere from 90 minutes to 2 hours each way. If your destination is one of the Magic Kingdom monorail resorts, and the Magic Kingdom is still open, you could take a bus to the Magic Kingdom, then either walk (to the Contemporary and Bay Lake Tower), hop on the monorail (to the Polynesian and Grand Floridian), or take a boat (to Fort Wilderness, the Wilderness Lodge, and the Grand Floridian). We suggest you still allow at least an hour for that. The fastest option, however, is almost always a taxi from All Star Music to wherever you're going; it's generally not more than a $20, 15-minute cab ride to get to most Disney hotels from the All Stars, and often less. Taxis are available outside the Melody Hall lobby; if a taxi is not already sitting out front, the bell services desk also serves as a taxi stand, and they'll call one for you. Being a value resort means that All Star Music doesn't offer many spectacular views. But there are a few rooms that are better than a parking lot. There's no large body of water near the All Star resorts so if you want a value resort with a lake view you should try Pop Century or Art of Animation. Building 1 doesn't have much to offer in terms of views. The major advantage of this Building is the short walk to Melody Hall. Rooms facing south look out on to the Calypso Pool. All other rooms in Building 1 either face a parking lot or foliage. Good views in Building 1 include rooms 1X01-1X09 (replace X with the floor number). Rooms 1X11-1X32, 1X33-1X34, 1X50-1X54 which look out at a parking lot. Rooms 1X41-1X48, which show a service area. Room 1433: This view is bad and noisy. Room 1663: Looking out at the Calypso Pool. Views in Building 2 mostly face foliage or a small courtyard with a fountain. Good views in Building 2 include rooms 2X01-2X10, and 2X55-2X63. Rooms 2X19-2X22, which face an electrical box. Rooms 2X30-2X32, which face a parking lot. Rooms 2X40-2X48, which show a service area. Rooms 2X64, which view is blocked by a large icon of a saxophone. Room 2446: This room directly faces a service area used by the hotel staff. Room 2501: Looking down at the Jazz Inn courtyard. Building 3 rooms facing west look out on to a courtyard and a giant jukebox icon. Good views in Building 3 include rooms 3X01-3X10 and 3X55-3X64. Rooms 3X33-3X37, which face a parking lot. Rooms 3X16-3X25, which show a service area. Rooms 3403 and 3458, which is partially blocked by a large electric guitar. Room 3447, which faces an electrical box. Room 3403: A good view turned bad due to a giant guitar. Room 3601: You'll feel safe knowing a large jukebox is watching guarding your building. Like Building 3, Building 4 also is themed after rock and roll. Good views in Building 4 include rooms 4X01-4X10, and 4X58-4X64. Rooms 4X11-4X13 and 4X21-4X32, which face a parking lot. Rooms 4X41-4X49, which show a service area. Rooms 4403 and 4458, which is partially blocked by a large electric guitar. Room 4X42, which faces an electrical box. Room 4432: We list this as a bad view due to its close proximity to a parking lot. Room 4509: This isn't the best view but at least it's peaceful. Building 5 has the disadvantage of being the furthest away from Melody Hall, there's also not much to see in terms of views as most of the rooms face foliage. Good views in Building 5 include rooms 5X01-5X10 and 5X55-5X64. Rooms 5X11, which faces a service road. Room 5457, which is mostly blocked by a large sculpture of a banjo. Rooms 5X16-5X29, which face a service area. Room 5633: It's a body of water but not one you want to go in to or look at. Room 5927: This isn't the best view but the noise level will be low. Like its neighbor, Building 6 is also far from Melody Hall. Good views in Building 6 include rooms 6X01-6X10, . Room 6403, 6407 and 6457, which is mostly blocked by a large sculpture of a banjo. Rooms 6X41-6X49, which face a service area. Room 6417: If you like foliage you'll love this view. Room 6455: Looking out at the walkway. Building 7 rooms facing east look out on a courtyard themed after a Broadway theater. Good views in Building 7 include rooms 7X01-7X10 and 7X55-7X64. Rooms 7X11-7X32, which face a parking lot. Rooms 7X40-7X49, which face a service area. Room 7601: It's just like the real Broadway. Room 7554: A bad view of a parking lot. Rooms facing West in Building 8 face a courtyard themed after a Broadway theatre. Good views in Building 8 include rooms 8X01-8X10 and 8X55-8X64. Rooms 8X14-8X22, which show a service area. Rooms 8X31-8X48, which face a parking lot. Room 8659: Do people still wear top hats in Broadway shows? Room 8443: Bad view a hotel maintenance area. Views in Building 9 mostly face foliage or a small courtyard with a fountain. Good views in Building 9 include rooms 9X01-9X10 and 9X55-9X63. Rooms 9X08 and 9X64, which view is blocked by a large icon of a saxophone. Room 9406: Nice view of a calm Jazz Inn courtyard. Room 9408: You probably won't want your hotel view blocked by a giant saxophone. 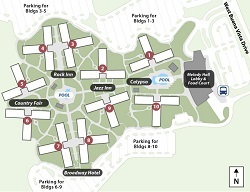 Like Building 1, Building 10's major advantage is the close distance to Melody Hall. Rooms facing North look out on to the Calypso Pool. All other rooms either face a parking lot or foliage. Good views in Building 10 include rooms 0X01-0X10 and 0X55-0X64. Rooms 0X11-0X26, which show a service area. Room 0432: The view is bad but at least you'll be close to your car and the hotel lobby. Room 0662: Overlooking The Calypso Pool. Rated 4.0 out of 5.0 based on 455 reader ratings.